Changing where the power comes from without moving the body. OK, my mind is officially blown. 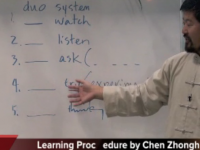 This video shows some of the depth of Master Chen’s training and teaching. This explains some of why his touch feels so mysterious. His comparison to using a keyboard illustrates to me my inadequacies. I move and respond like a single fingered typist. This is part of the reason I toss so much. When I am touched, I fight with one finger. When Master Chen touches me, I cannot respond beyond the one finger. I cannot comprehend his many fingers on me and I am not sure why I fall down. I have seen the weakness in my structure seemed to be related to singular focus. With this video, I can see that “change without moving” is a whole different level of using the body.